The introduction of Beocord 5000 was an important step for B&O, in as much as it represents a complete move away from open reel and a commitment to cassette as a medium for high quality home recording. Text copyright © Beocentral. Unauthorised reproduction prohibited. There had of course been cassette machines in the range for a long time before Beocord 5000, and all of them offered a very good standard of reproduction, but they were never intended to replace open reel as the preferred format when quality was paramount. A few years previously, a prototype open reel machine had been designed, using all the best technology available at the time, and this included a closed loop dual capstan layout and electronic tape transport controls. Whilst this machine (confusingly given the provisional name of Beocord 5000!) was undeniably an engineering masterpiece, it was realised that the days of open reel as a practical domestic format were already over. A multitude of speeds, spool sizes and track formats had made the issuing of pre-recorded tapes impractical, and “live” home recording had declined, so it was decided not to proceed with the production of this range of machines, and only six were built. Text copyright © Beocentral. Unauthorised reproduction prohibited. To produce a cassette recorder to compare with open reel performance was not an easy task. So far, all B&O cassette decks, such as Beocord 900, 1100, 1700, 2200 and the cassette section of Beocenter 1400, had been based around a simple mechanism of Japanese origin. This was capable of better than average results, and was sturdy and quiet in operation, but to reach a new level of performance, B&O decided to design and build their own. Text copyright © Beocentral. Unauthorised reproduction prohibited. The resulting mechanism was unlike anything yet seen, and featured fully electronic control, closed loop dual capstans, an electronically controlled AC motor with servo feedback from one capstan pulley, ferrite heads, separate reel drive DC motor, friction damped cassette lift, oversized interleaved flywheels and separate record/replay heads. The quality of the engineering brought to mind the Beogram 4000 turntable, and the performance was every bit as good as had been promised. Text copyright © Beocentral. Unauthorised reproduction prohibited. To go with the new mechanism, an electronic control system was devised were by momentary touches of the control switches would activate all the functions, and this included a very useful fade in/out facility which left the recording level controls undisturbed. Functions in use were indicated by light displays behind the black plastic top, and the recording level meters were also in the form of a light display, another first for a B&O tape recorder. Text copyright © Beocentral. Unauthorised reproduction prohibited. Either ferric or Chromium Dioxide tapes could be used, as with all B&O cassette decks, but for the first time the selection was automatic, making use of a standardised sensing hole in the back of the cassette. The use of a separate reel drive motor made fast forward and rewind very fast, and the rewind time would not be equalled by a B&O cassette recorder until the Beocord 5500 of 1987. Text copyright © Beocentral. Unauthorised reproduction prohibited. The three head arrangement of the Beocord 5000 did not prove completely satisfactory in use. The factory claimed that tape-matching was poor, and because of the layout of the heads, with the record head positioned after the playback head, off-tape monitoring was not posible either. Because of this, later Beocord 5000s were fitted only with two heads, the record/playback one being a Sendust type of new design. This more conventional layout improved the performance and stability of the machine, and simplified adjuistment as the recording equalisation was now fixed, rather than being adjustable. The third digit of the type number of the later machines was changed from a 0 to a 1 (e.g. 4705 became 4715) to mark the difference. Text copyright © Beocentral. Unauthorised reproduction prohibited. 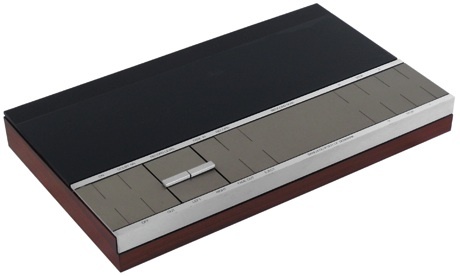 The Beocord 5000 was the only model to use the dual capstan version of the B&O cassette mechanism. Its only other use, in simplified single capstan form, was in the Beocenter 4000. Despite all its advantages the mechanism was complex and expensive to produce, as well as being very large. Beocord 8000, which replaced the Beocord 5000 as the top of the range cassette deck used a new electronically controlled Japanese mechanism with a single DC motor and a single large flywheel, which took up less than half the space inside the cabinet and used far less power to run. Text copyright © Beocentral. Unauthorised reproduction prohibited.